JD Martinez is mashing. 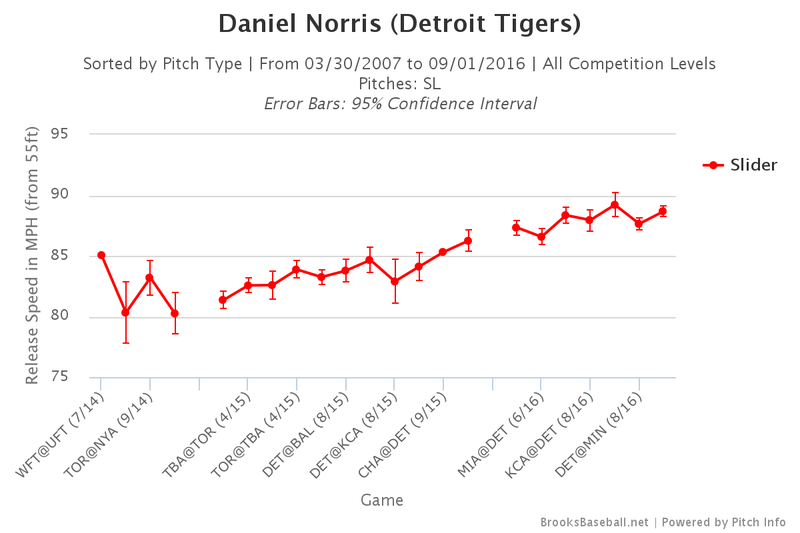 After a slow start, he has a 148 wRC+ this season and has been particularly great since coming off the DL. Any questions we had about his bat early in the season have been answered. But if you take a gander at his Wins Above Replacement (WAR) at FanGraphs or Baseball-Reference, you’ll find that Martinez is not keeping pace with his 2014 and 2015 numbers despite the excellent performance at the plate. This is because the two major advanced defensive metrics believe he’s been an atrocious defender in 2016. Let’s start with the basics. In 900 innings entering Friday, Martinez has -20 DRS and -12.3 UZR. Given that he’s playing in right field, that means his overall defensive value relative to an average player is around -20 to -30 runs. That’s a huge deal. If accurate, we’re talking about two or three wins of value lost relative to average. And average is a good baseline here because that’s roughly what Martinez was in 2015. Okay range and a good arm allowed last year’s version of Martinez to look above average for a cornerman. This year, the numbers tell a much different story. Now, there are many people who are skeptical of the way advanced metrics are calculated. There’s a level of imprecision that can lead to some error, and of course, there are sample size considerations. So let’s use some analog methods to see how JD measures up. First, let’s take a look at fly balls (> 25 degree launch angle) to right field (defined as the right third of the diamond) and consider how often those fall for hits. League average BABIP on fly balls to right field is about .117, per Baseball Savant. Keep in mind that “fly ball” is somewhat subjective, but this is good enough for our purposes. If you look at the Tigers values for the same stat, pulling out the games while he was on the DL, it’s right around .136. In other words, fly balls to right field have been landing for hits pretty often with JD in right. Now, there are some obvious caveats. The first is errors, as those won’t count as hits using BABIP, but all outfielders make a small number of errors so it shouldn’t swing things much. Second, line drives and ground balls are hit to right field too, so there are other types of plays we aren’t covering. Defense is also more complicated that just hit/out. This is a rough estimate. But just using this method we’re talking about 4-5 extra hits relative to average, and if you assume three are singles and two are doubles, you’re talking about 4-5 runs of value using linear weights. But there’s actually more to it that simply not getting to as many balls. Martinez’s arm was extremely valuable last season, throwing out runners and preventing them from advancing at a high rate. DRS and UZR pegged that value at +5 to +8 runs last season. This year, they think it’s around -3. Again, these aren’t super precise, but that’s an 8-11 run swing. Fortunately, Baseball-Reference provides some more granular data. They track opportunities, holds, and kills for outfielders. An opportunity is one of five things: single-man on first; single-man on second; double-man on first; flyout-runner on third; and flyout-runner on second. So how often is a ball hit to you in those situations, how often do you hold them to the expected one, one, two, zero, or zero bases, and how often do you throw them out? Let’s look at JD over the last two years and 2016 league averages. Keep in mind that not every category has a huge sample, but we’re talking about 284 total chances for JD over the two seasons. 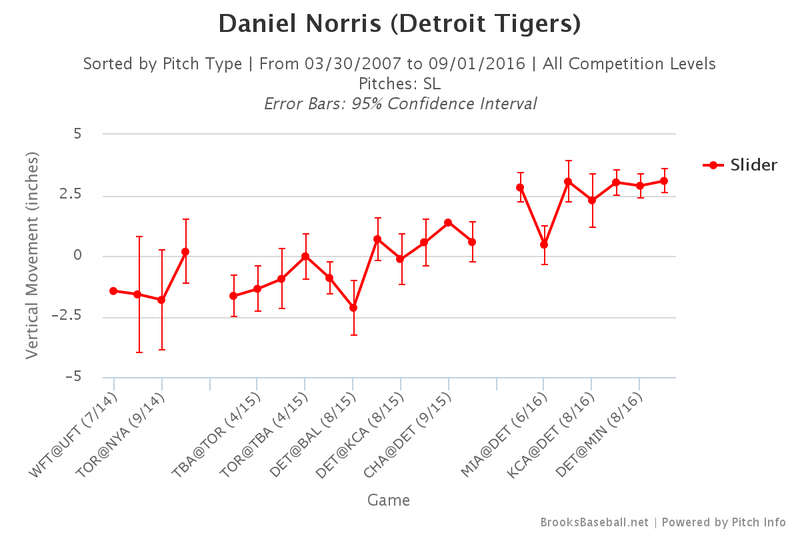 As you can see, he was above average in 2015 and is well below average this year. In terms of overall hold rate, he’s gone from a top five player to a bottom five player in just one year. In particular, he’s struggled in three of the five categories. 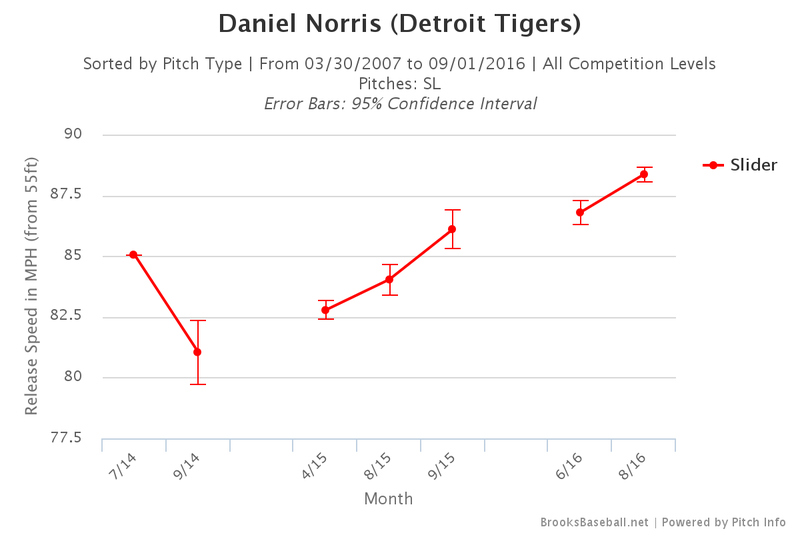 This backs up the run values we saw the metrics put on his arm, just like the raw BABIP supported a lesser range. Add that to the fact that he’s made five errors this year compared to last year’s two and you have a pretty clear picture that he’s much worse on defense, even if you want to quibble about the precise value used by the advanced metrics. It’s easy for fans to brush this aside with a “we pay him to hit” mantra, but that’s a very misguided way of looking at the game. Every run you give away on defense, you have to make back with your bat. Sure, Martinez is one of the two best hitters on the team and would find his way into the lineup on any club, but it’s obvious that a Martinez who is solid in the field is more valuable than one who is not. 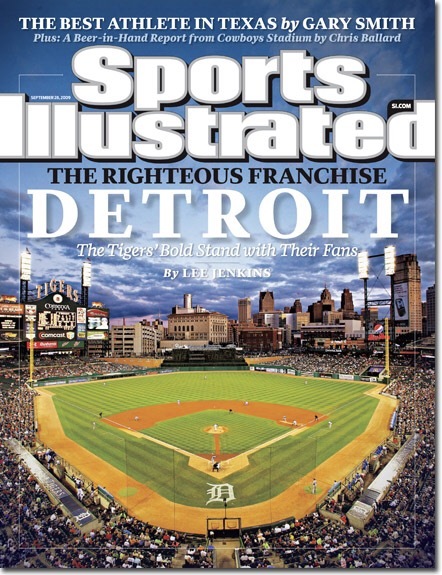 It looks an awful lot like the Tigers could miss the playoffs by one or two games this year. There are two ways to look at that. Either you could put the blame on almost everyone (including JD’s glove) or you could put it on no one because there are so many people who could have made the difference. Either way, the fact that Martinez has fallen off on defense might not seem obvious to fans who focus entirely on offensive stats, but if you look even a little bit closely at his performance in the field, you see a player who has cost his team runs. And runs are currency, no matter where they are found. One thing that’s really important to understand if you want to properly manage a bullpen is the concept of leverage. That is, the game is on the line more in certain moments than in others. Tie game, bottom of the 8th, runners on second and third? That’s high leverage. The difference between a hit and an out is significant. Five run lead in the 6th with the bases empty? That’s low leverage. A hit or an out won’t make much difference in the outcome of the game. Ideally, you want to put your best relievers into high leverage situations because that gives you the best chance to escape without much damage. Of course you want to consider workload and matchups, but in general Good Relievers = High Leverage, Bad Relievers = Low Leverage is what you want to see. So I thought in might be interesting to see how Ausmus has been doing in terms of using his relievers based on leverage. 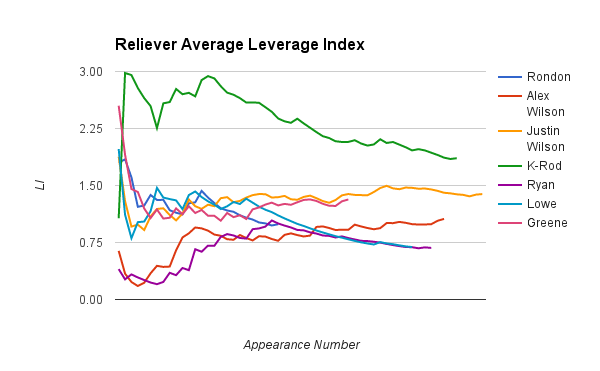 So I grabbed the average leverage index of each reliever’s appearances (min. 20 IP) and made a couple of graphs. Two quick notes. First, I removed Greene’s starts for obvious reasons. 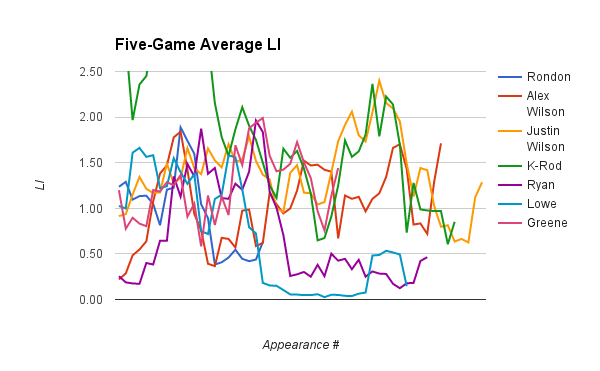 Second, this is the average leverage index of the total appearance because I wasn’t able to easily grab the leverage index at the entry point for each reliever. As a result, if you come into a game with the bases loaded in the 8th, get out of the jam, the team scores a bunch, and then you get three more outs, you are going to get a little bit screwed over. It’s a proxy, but I think it works fine. Also keep in mind that the relievers have made a different number of appearances, but for your sake I’m putting them all on one graph. So that means Rondon’s line ends earlier than K-Rod’s. This is not by date, it’s by appearance number. This is a good demonstration that K-Rod is clearly the guy Ausmus turns to in high leverage moments, but the reality is that his average is buoyed by the fact that he almost never gets mop up duty. 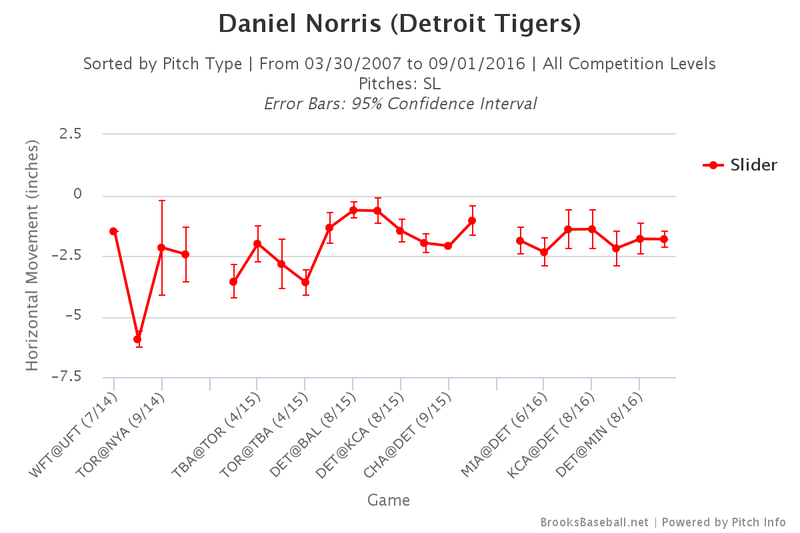 Most save situations are reasonably high leverage, but it certainly helps that he doesn’t get many six run games. You can also pinpoint the moment when Greene became a higher leverage option and Lowe, Rondon, and Ryan stopped getting big chances. But this graph is a little less helpful than you want it to be, so let’s try something else. 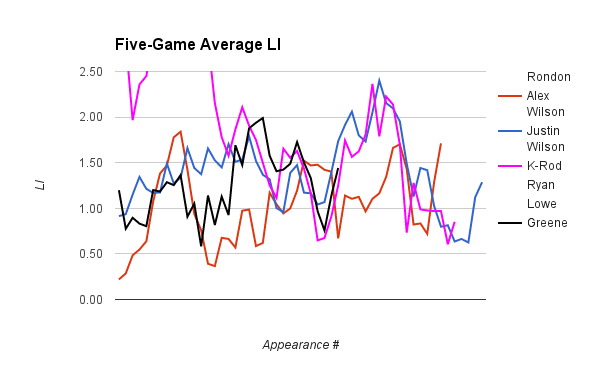 Here are the rolling five-game averages starting at appearance five. 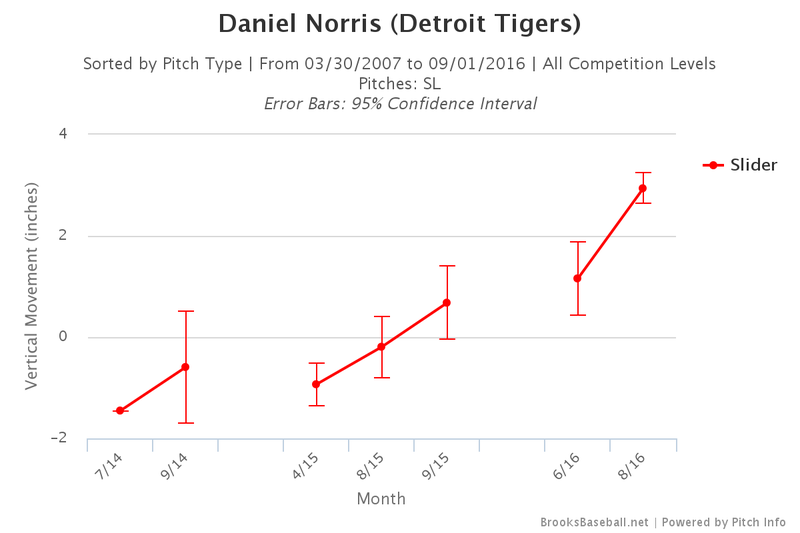 This gives you a better sense of Ausmus’ mood. He’s obviously hasn’t had much faith in Lowe and Ryan lately, but this gives you a better sense than Alex Wilson and Greene are getting high leverage chances just as much as K-Rod and Justin Wilson lately. I know it’s a bit chaotic, so let’s just look at the current top four guys. I changed the colors to make it easier. We judge managers on individual decisions, but in the aggregate it’s pretty clear that Ausmus has figured out who his best four relievers are. He might still pick the wrong one at any given moment or inexplicably decide trailing by one run is much different than being tied, but at the very least he knows which of his guys are good. It’s a low bar, but it’s the one that’s been set.